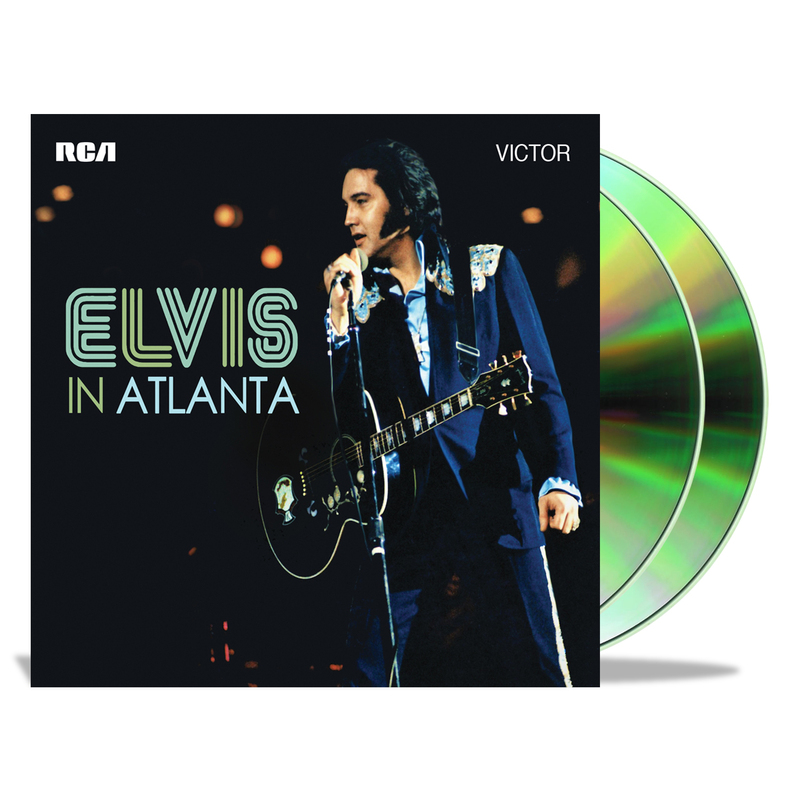 “ELVIS IN ATLANTA,” the new release from Follow That Dream, contains two legendary shows from the Omni Coliseum in 1975 on April 30th and May 1 respectively. It has often been reported that Atlanta was one of Elvis' favorite cities to play. These shows are pretty convincing evidence judging from his response to the audience enthusiastism. Elvis puts on a couple of his best performances of the year at the Omni. His voice is in great shape. He adds "My Boy", "Burning Love", "T-R-O-U-B-L-E" and "I'll Remember You" to his otherwise standard set list. And, the soundboard quality is very good. A must for anyone looking for a great performance from 1975. The 2 concerts are great. And very good sound quality. The artwork for this double cd is very good. I really love these concerts. 2 great shows! Just love it! His voice is as good as ever & I'm never disappointed listening to anything of Elvis! The live recordings are always welcome & they make you feel you wished you'd been there!! This is a great set.Recommend for all Elvis fans. A great addition to my Elvis collection. It was great to see FTD finally release a concert from Atlanta Ga. I was a Licensed Security Officer in the state of Georgia and was contracted to work the Elvis concert that was just released. I worked the May 1st & 2nd concerts. Elvis was in great form and the audience got to hear some Elvis music that he rarely performed such as 'Help Me Make It Thru The Night' and the new release 'T-R-O-U-B-L-E.. They heard two gospel songs that Elvis performed so well, 'Help Me & Why Me Lord'. And of course, Elvis performed a lot of his Standards like 'Love Me Tender, All Shook Up' and The song that started it all, 'That's All Right'. FTD always has great photos to show from the concerts and this one really went all out. It featured 11 photos from the two shows. Elvis wore the White outfit on April 30th & The Dark blue on May 1st .My favorite photo is the one that shows him holding the pink & white polka dotted scarf Because I owned that scarf for about 5 years and have several of my own photos showing that scarf in my private Elvis collection that is extensive. I donated it to a Elvis Museum in Columbus GA in 1980 along with some other Elvis items I had collected including a lifetime backstage pass to any Elvis Concert. Sad to say but the Museum closed it doors and the items and Scarf are lost . I'm Thankful for the photos that FTD published because they give the true Elvis fans a chance to see how great Elvis looked when he came to Atlanta. Be sure to get this great release + it offers two concerts instead of the usual one show. A great bargain to be sure. Hope you enjoy /';m reading my review. The songs we hear on these two shows are mostly the same songs Elvis performed on his shows throughout his concert years. However, each song performance is a little (sometimes alot) different from concert to concert. Always great to listen to Elvis at work. How he interacts with the audience certainly varies from show to show. Always entertaining, always changing with each show. 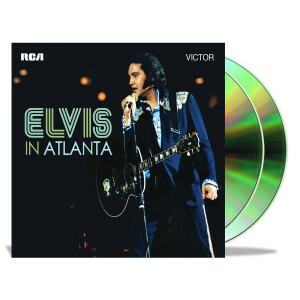 The new "Elvis in Alanta" two-disc CD set from FTD is a worthy addition to your Elvis music library. The old time recording are still great. They bring back fond memories. This is a great cd, two shows 4/30/ & /5/1/ 75. Long live the King.. FTD took that one out of the ball park .Thank you , thank you very much.